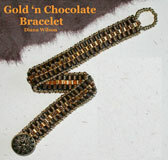 Rich Chocolate Brown and Glowing Gold Size 8 Delicas come together for a quick & easy project. The peyote stitched bracelet base is smooth and supple to the touch, a pleasure to wear. Simply add a decorative metal button and a few delicious accents using size 11 and size 15 seed beads to complete this classic bracelet.